At the Skybury plantation they have developed their own unique process to get the antipodean green bean to market, using Bourbon and Katuai varieties of Arabica. They have a strong emphasis on the environment, and a keen eye for detail. The coffee has sweet touches of chocolate, hazelnut and caramel and produces great flavours when flame roasted. 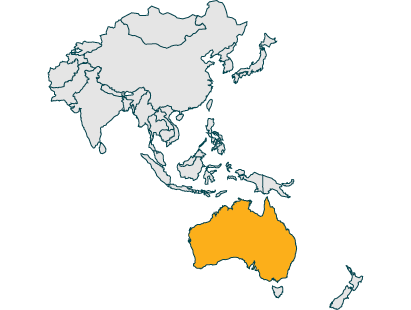 Australia sits just outside the more familiar growing region of South Asia. Where is Australia Skybury Fancy Grown? The plantation is located in Mareeba, Queensland. The town is 1,368ft above sea level and is home to around 10,181 people. With average temperatures ranging from around 16.6 °C to 29.0 °C, it has great condition for growing coffee. It also gets around 36 inches of rainfall every year, which also contributes to the quality. Mareeba is seen as the heart of Australia’s coffee growing, and is ‘known not only for its purest Australia Arabica Coffee, but also its breathtaking views, lovely light lunches, yummy cakes, great hospitality and the freshest fruit straight from the farm’, according to the owners of Skybury. Ian and Marion MacLaughin purchased their Skybury plantation in 1987. This was the same year they immigrated to Perth after living in Oman and the UK for a while. They returned to Australia after leaving in 1981 because of the culture and climate. After considering many business ventures, they put their bets on the wonderful coffee industry and we are so glad they did. Today, they are Australia’s largest exporter of Arabica beans and were the first in Australia to export green beans to Japan, Europe, Canada and the US. Typica – Can be grown in any coffee producing region and has led to the development of many other cultivars. Bourbon – Originally developed by the French in 1708 on an island in the Indian ocean names Bourbon. Caturra – Discovered in a town in Brazil named Caturra. Katuai – The result of a cross between Caturra and Mundo Novo. Mundo Novo – A hybrid of Bourbon and Typica formed in the 1940s. Blue Mountain – A variety of Typica grown in Jamaica. At the Skybury plantation, Bourbon and Katuai varieties of Arabica Coffee are grown. How is Coffee Produced at the Australian Skybury Plantation? Skybury has tried and tested many different ways of producing coffee since 1987 to see how they could produce the highest quality. They have from experimental to commercial and have overcome some tricky issues such as synchronised flowering, harvesting, plant rejuvenation and nutrition for the Australian conditions. From all of this, they have found a process to get the best out of their beans. They have created a unique coffee wet processing, which really brings out the brilliant flavours of Skybury beans. Another reason as to why it is so premium is that they are able to ‘shape’ the flavour of their coffee, heightening the best flavours, as they have one of the world’s most sophisticated processing facilities. When Skybury Coffee is roasted, the skin of the bean ‘caramelises’ and releases a sweet, chocolate flavour. Until I tried this I was unaware that Australia produced coffee. I must state that I was more than pleasantly surprised. There is a sweetness and depth to these beans that were totally unexpected. I am most impressed by the fresh taste and guess the beans were recently roasted. Love this coffee and will buy more soon. A very nice balanced coffee. Definitely better through a dripper than aeropress. As above, a very subtle sweetness with little bitterness. Not sure if I was just unlucky, but a very disappointing bean. 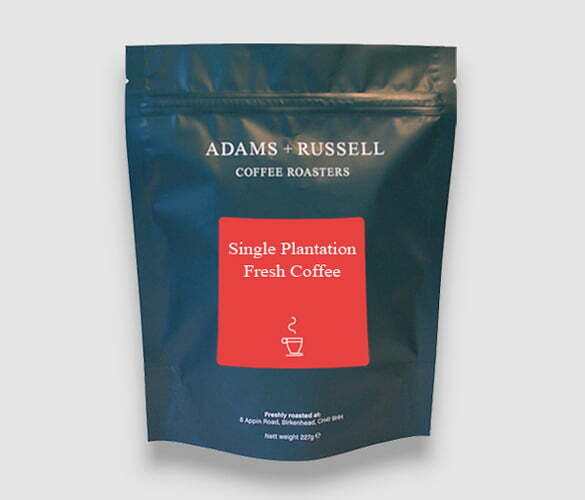 Lacking any notable flavour, and makes for a very watery cup compared to the other great beans I’ve had from Adams and Russell. Bad batch maybe? Hi Nick, thank you for your feedback regarding the Skybury and apologies it didn’t live up to your taste buds. Many of our customers love this coffee and so it’s a surprise to hear you had a bad experience. We do have lot’s of other coffees that may offer a stronger taste and hope you would be open to trying some of those. Kind regards, Matt. Brew method: French press, 16g beans freshly & fairly coarsely ground, filtered @ 250 microns, 300 ml filtered water, approx. 92 degrees, 30 sec. bloom + 4 min. brew. Really an excellent coffee – mellow and balanced, while not being bland. It just tastes as coffee should. I found it does need time to steep – otherwise it really lacks taste. I also once accidentally put in the fines I’d ground off, and this ruined it, so filtering definitely necessary. It’s probably too pricey to treat as a regular coffee, but will probably get again, as it is among the best I’ve tried. This I really liked. Different balance not quite Mountain Top, bugger the Japanese market, bur this is pretty close. Stop buying it; I want it all!